Co-sleeping is a hot topic in the mom world. Either you’re against it or you’re for it. Me? I was for it with my first and against it with my second. I was all absolutely no way no how will I let her sleep with us. She will go to her crib from the Rock’n’Play at exactly four months and she will sleep through the night. She won’t cry it out, she won’t be attached to me, nope. This one will be different. And for awhile, it was. I’d nurse her, put her down, and she would stay sleeping for 6-7 hours. She’d wake up, I would nurse her back to sleep, and then she would sleep for 4-5 more. Well here we are in the 16th month of her life and we seemed to have regressed. The minute you put her down (or try to ), she screams and grips onto you like she’s about to fall off a cliff. She wants nothing to do with her crib, only wants me to hold her, and has recently started sleeping in our bed because it’s the only way any of us are getting any shut eye. 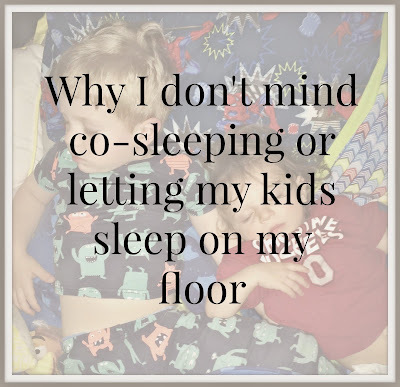 I know, there are so many reasons people are against co-sleeping. I’m against it for some reasons too. My three year old son sleeps on our floor every single night. We’ve tried his own full size bed, but he wants nothing to do with it. Why? He says he’ll miss me. How do you argue with that? Is it really that big of a deal that he needs to sleep in his own room? I mean I certainly wouldn’t be comfortable on the floor and want to sleep there night after night, but hey if he is, what’s the big problem? We all parent differently. And we should never feel bad about our choices or decisions. Did I see myself in this position? Never. But here I am, not sure how to change it or “get out of it”, so I guess I need to embrace it. Why? You’ve heard me say it once and I’ll say it over and over again, but there’s going to come a time when they want nothing to do with me. So if I’m “spoiling” them with allowing them to sleep in my bed or room every night, what’s the big deal? They won’t do it until they’re 18. And their friends will probably make fun of them eventually. And that will be the last time they ever want to snuggle or sleep with me. And it will break my heart. So for now, I don’t mind. The number one question people always ask me when I tell them we co-sleep is “don’t you and your husband need your own time and space?” And yes, we do. But trust me, there are plenty of other times and ways we show each other love and affection. They don’t come into our bed until we are sleeping, so besides the slight discomfort from having three bodies (and sometimes two pets) in a bed, I don’t care at all. « 1 outfit, 2 looks.